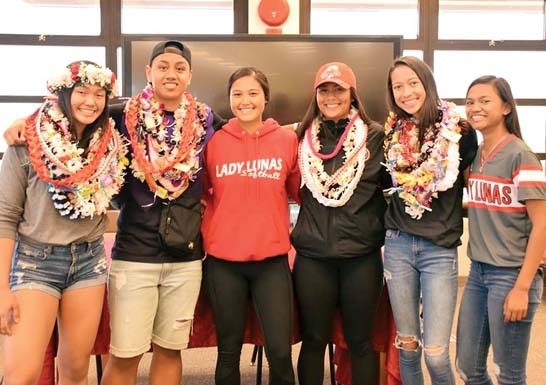 PUKALANI — When Maui High School’s Jon Aunese put down his 20th and final kill of the night Monday at the King Kekau­like gym, a wide smile broke out across his face. 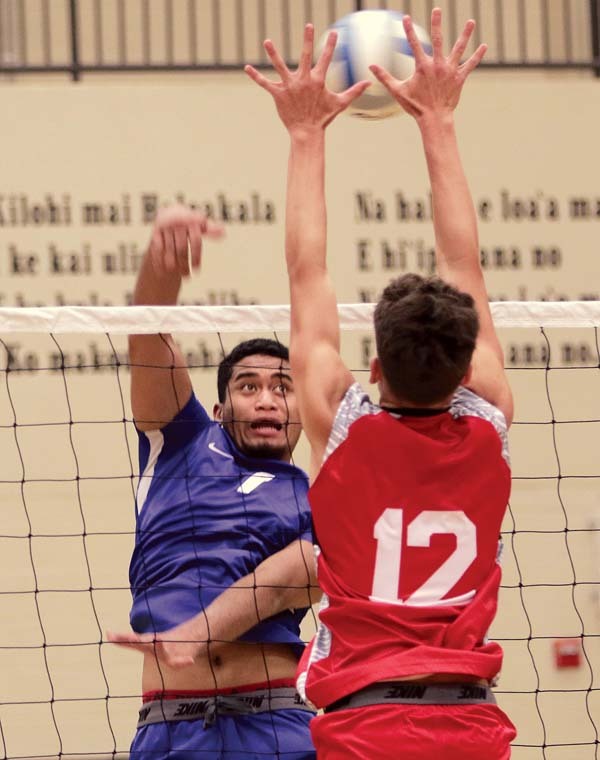 It capped a 25-21, 23-25, 24-26, 25-20, 15-10 win over second-seeded Lahainaluna in a semifinal of the Maui Interscholastic League Division I boys volleyball tournament that kept the season alive for the third-seeded Sabers. 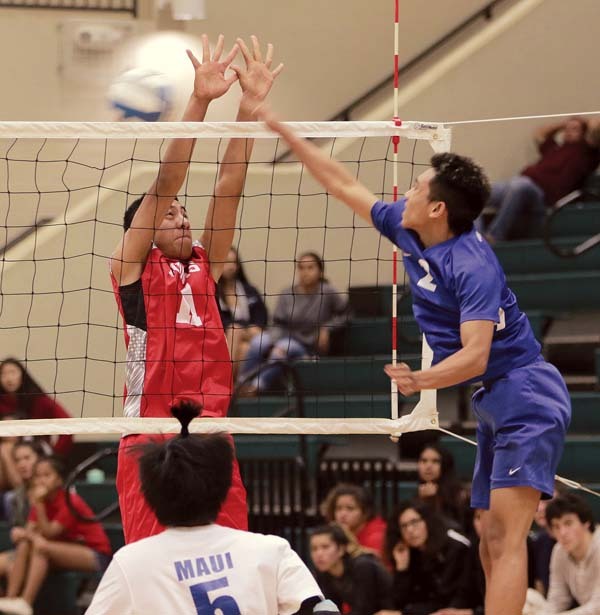 Maui High broke away from a 6-6 tie in the fifth set and took a lead it would not relinquish on a kill by Julius Benavidez. Lahainaluna’s Ko‘i Kekona tries to block Maui High’s Rexie Butihi in the first set. Maui High (7-6) advances to play Kamehameha Maui in the MIL D-I tournament final tonight at Na Alii’s gym. A Kamehameha win would send the Sabers to a second-place playoff match with the Lunas (9-4) on Wednesday with the final MIL state berth on the line. A Maui High win tonight would clinch a state berth for the Sabers and force a championship playoff match against the Warriors on Wednesday. 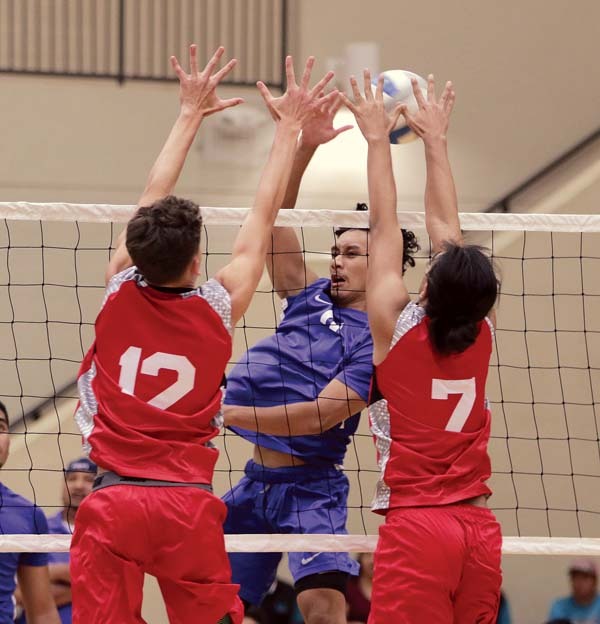 Denniel Carreon dished out 43 assists and Ryan Piano was credited with 40 digs for Maui High. Maui High’s Chey Higashiguchi is met at the net by Lahainaluna’s Tekoa Sonognini and Nicholas Gayagoy on Monday. The Lunas appeared to take control by pulling out a hard-fought third set and then jumping out to a 5-0 lead in the fourth. The third set was tied at 22-22 before the Lunas got to set point on a Maui High error and a kill by Elijah Oliveira. The Sabers tied it up on a kill by Matthew Hirose and an ace by Trent Takara. Oliveira smacked home a kill after an over-pass by the Sabers, and Tekoa Sonognini’s block on Aunese finished it. In the fourth, the Sabers caught the Lunas at 7-7 and took an 8-7 lead on a kill by Benavidez. They pushed the lead to 10-7 on a dink by Carreon. A Lunas error that gave the Sabers a four-point lead brought a timeout from Lahainaluna coach Daniel Schultz. The Sabers continued their run to take a 24-17 lead and finally ended the set with a kill by Benavidez. In the fifth, Maui High led 14-9 after a Lunas error. Aunese skied high to put down the final kill left-handed moments later. 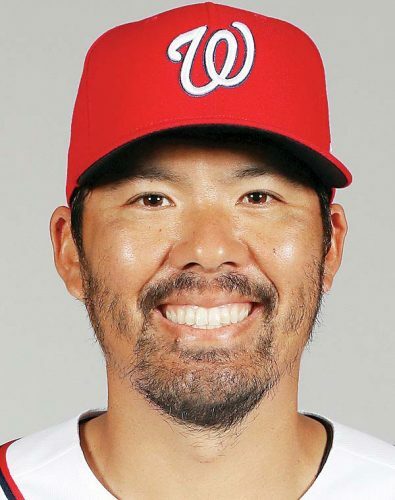 No statistics were available for the Lunas. 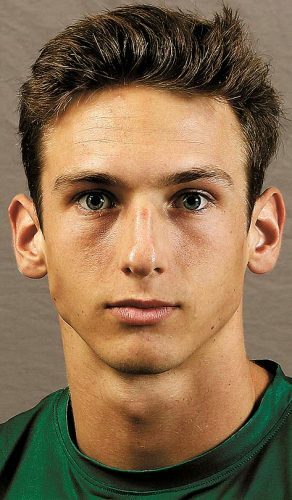 “There were a lot of errors on both sides, so I can’t say that it was really pretty,” Schultz said. “Our team is used to having someone step up and make some good plays and it didn’t seem like anybody was willing to do that today. … I told my guys before this game that Maui High is a super scrappy team, they have a couple of great athletes that can be real dominant hitters.